It’s time again to just relax as we share experiences and expertise. Please plan on attending and participating. We will be in our usual meeting location in the Unitarian Church annex. 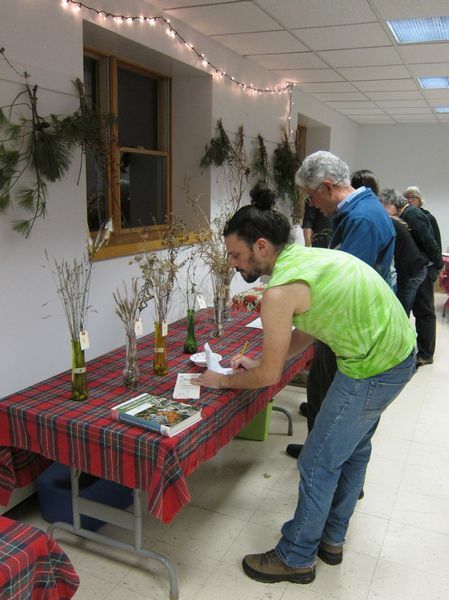 Our annual Seed Exchange is part of the festivities. A list of seeds we already have is included with this mailing. Please get in touch with me (or info@flnps.org) if you have native plant seeds to offer and want a photo included on our board. Remember, you can take seeds to plant whether or not you bring any. Even if you have no more room in your garden, the gathering is the perfect time to decide what you want to grow for FLNPS to sell at the Spring Plant Sale - many species require a cold moist stratification period before they will germinate. The plants we use to decorate the room for the gathering give us materials for an Identify the Decorations “Quiz”. This is always fun as well as educational, as we expect people to collaborate and you don't need to get any of the answers right to qualify for the Door Prize Drawing. It's always fun to have some new and different species and this year Arieh Tal is providing them. Every year, Door Prizes are donated by members. If you would like to contribute in this way, again, please let me know early so we know how many to expect. We may save some for the January Members’ Night! To keep up our energy during all these activities we ask everybody to bring some Food With a Native Element and prizes will be awarded to the creator of the foods voted favorite by the most participants. 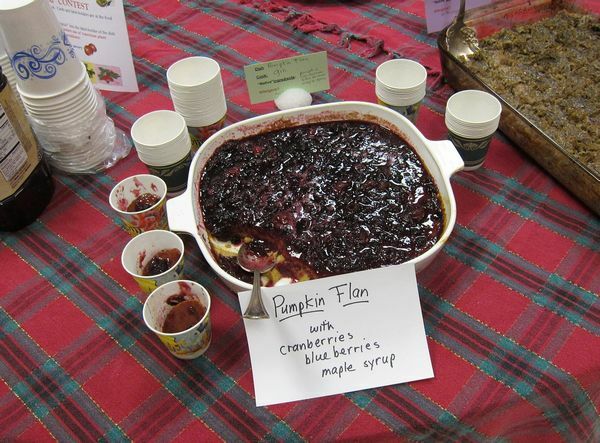 We’ll have two prizes this year, one for sweet and one for savory dishes. You can think “outside the box” here. 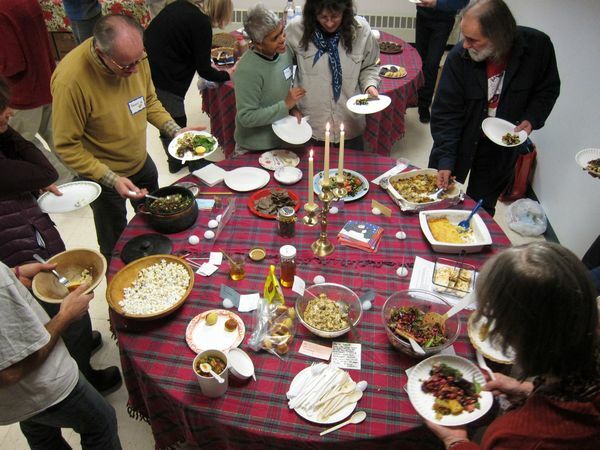 Besides the all time popular blueberry, cranberry and apple dishes there are many possible ingredients from native plants like black walnuts, butternuts, maple syrup, elderberries, wild rice, mushrooms, quinoa, squash, peppers, corn, potatoes (Meso American origin is OK). Creativity and truly local ingredients are appreciated. Finally, we always need help with Set Up and Clean Up and contact info@flnps.org if you want to volunteer for either. It’s fun and friendly. Please come and enjoy plants and plant-loving people. And a good time was had by all! A photo recap of the winter plant ID quiz is available here. 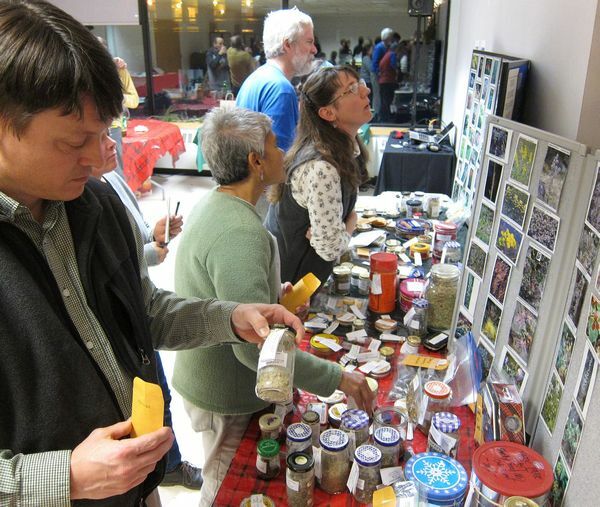 Choosing seeds at the Solstice event - with photos to help recognize what is what. Native and Naturalized Plant inspired dishes. 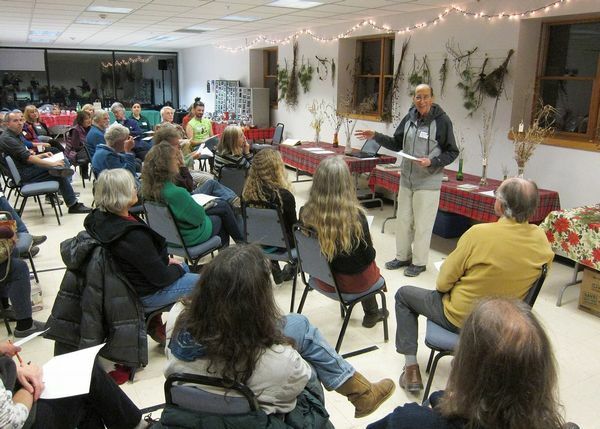 The winter plant ID quiz, cooperation encouraged, & Arieh explaining the answers.